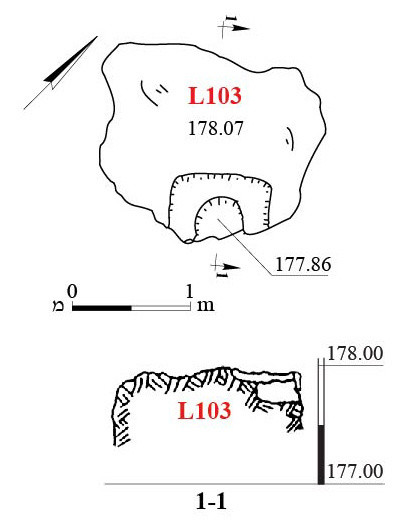 In November 2015, a salvage excavation was conducted at Lot 31 in the Ligad Center in Modiʽin, near Horbat Haruba (Permit No. A-7569; map ref. 197283–362/647293–394), prior to construction. 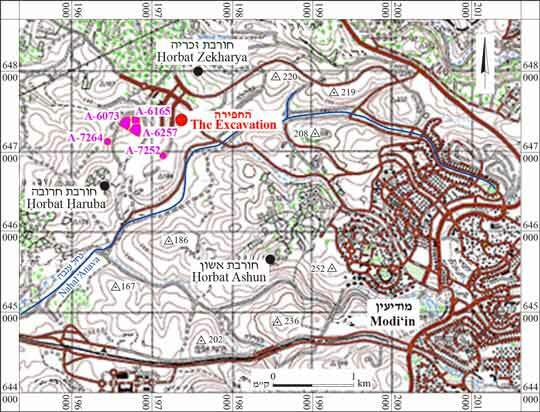 The excavation, undertaken on behalf of the Israel Antiquities Authority and financed by the Massad Project Management Company, was directed by R. Toueg (field photography), with the assistance of Y. Amrani and E. Bachar (administration), A. Hajian and M. Kahan (surveying and drafting) and N. Zak (plans). 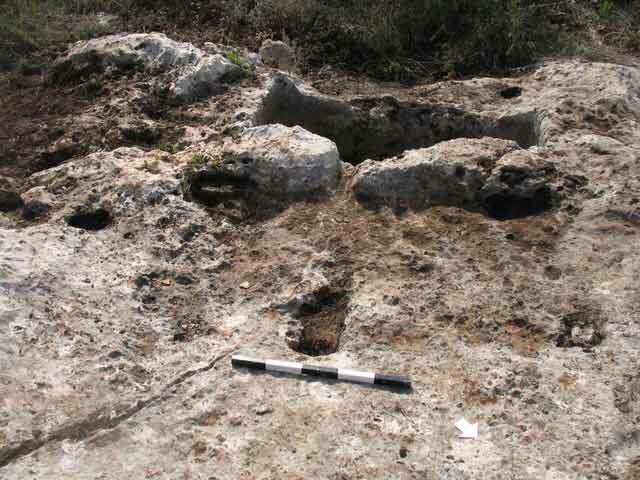 The excavation was carried out on a hill that slopes to the west, yielding two winepresses, three cupmarks and a bodeda. An agricultural site, Trig. 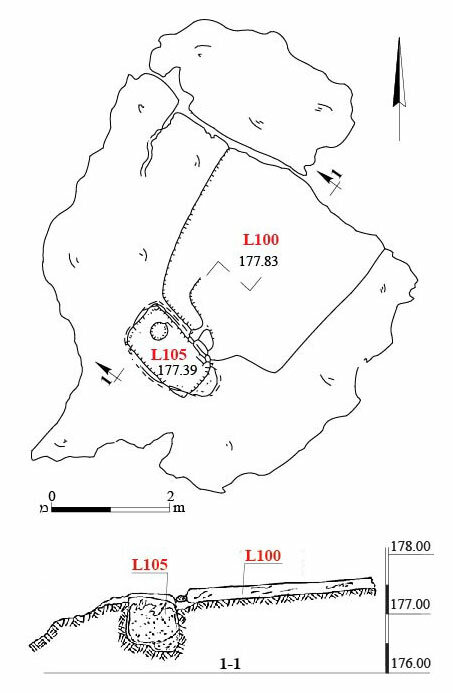 Point Z-184, is located nearby; rock-hewn winepresses and agricultural installations were previously excavated in its vicinity (Toueg 2015, and see references cited therein; Crispin 2015; Fig. 1). 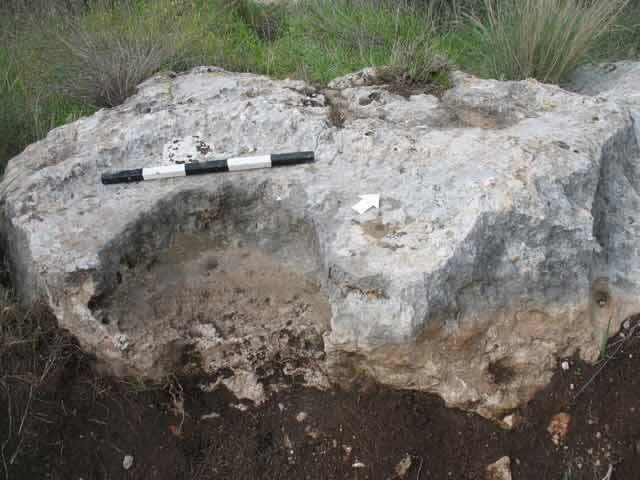 A hewn winepress was revealed in the northwestern part of the lot, at the northern end of a flat boulder, thus not require much rock-cutting. The winepress consisted of a treading floor (L100; 3.1 × 2.4–3.2 m; Figs. 2–4)—a hewn level with raised edges, save the one in the northeast which terminated at the end of the boulder. 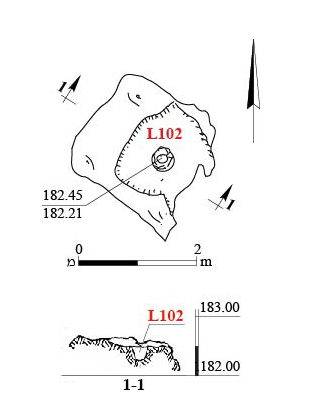 The treading floor sloped gently toward the southwest; a narrow channel and through-hole were cut in the center of its southwestern hewn wall to allow the must to flow into an irregularly shaped, rock-hewn collecting vat (L105; 0.50 × 0.85 × 1.50 m). A shallow cupmark, hewn in a small boulder (L107; diam. 0.3 m, depth 0.2 m; Figs. 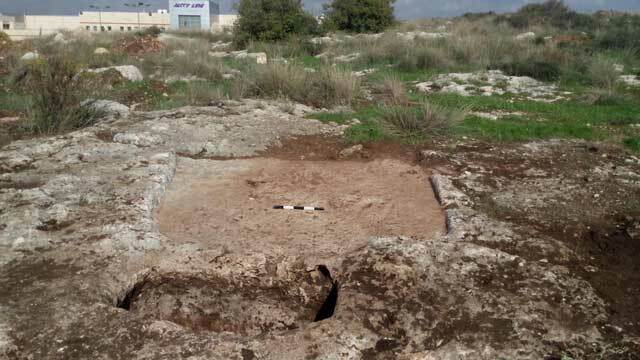 5, 6), was unearthed c. 20 m northeast. A bodeda (L101; Figs. 7, 8) was hewn in a boulder c. 20 m southeast of the winepress. It consisted of a round cupmark (diam. 0.5 m, depth 0.29 m) and a shallow, arch-shaped channel to its west, which apparently served to convey liquid to the cupmark. Another cupmark (L102; diam. 0.5 m, depth 0.24 m; Figs. 9, 10) was hewn in a prominent boulder in the northeastern part of the lot. It was hewn near the edge of the boulder, and a shallow depression was cut along three of its sides. 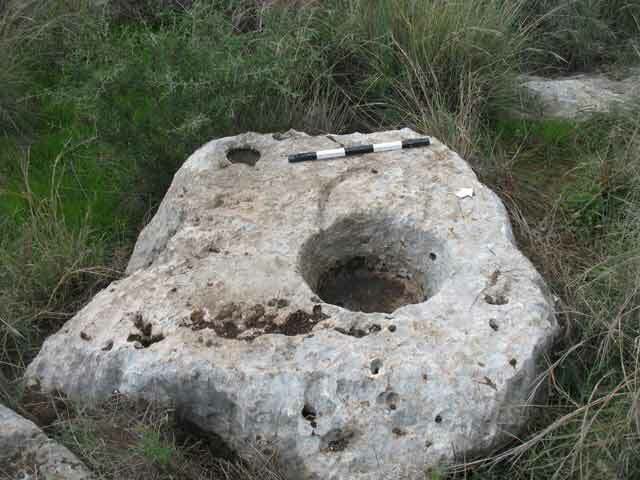 Another hewn winepress was found on a boulder sloping to the southwest in the southern part of the lot. It consisted of a square treading floor (L104; 1.5 × 1.5 m; Figs. 11, 12) and a shallow channel at its end that drained the must into a hewn rectangular collecting vat (L106; 0.74 × 0.80 × 1.50 m). The natural gradient of the boulder was taken advantage of when planning the treading floor, thereby requiring minimal quarrying. 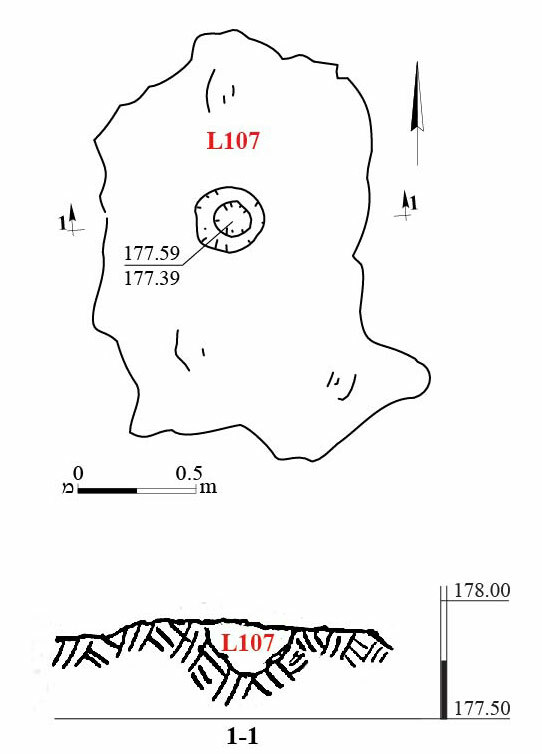 Half of a cupmark (L103; depth 0.21 m; Figs. 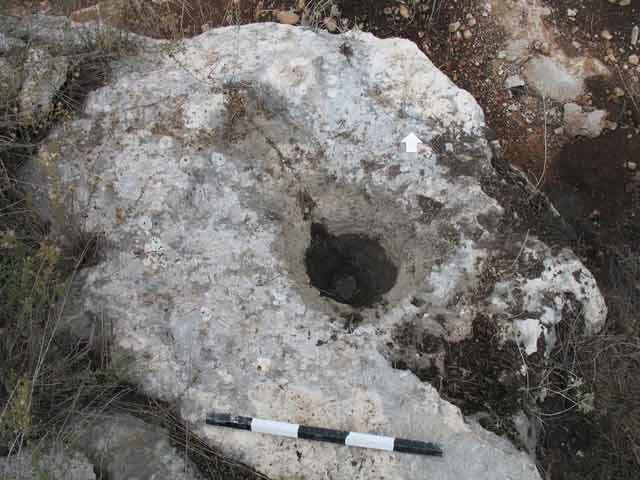 13, 14) was preserved in a boulder c. 12 m north of the winepress; the boulder apparently cracked and broke in the past. No pottery sherds or other artifacts that could aid in dating the winepresses and cupmarks were discovered in the excavation. 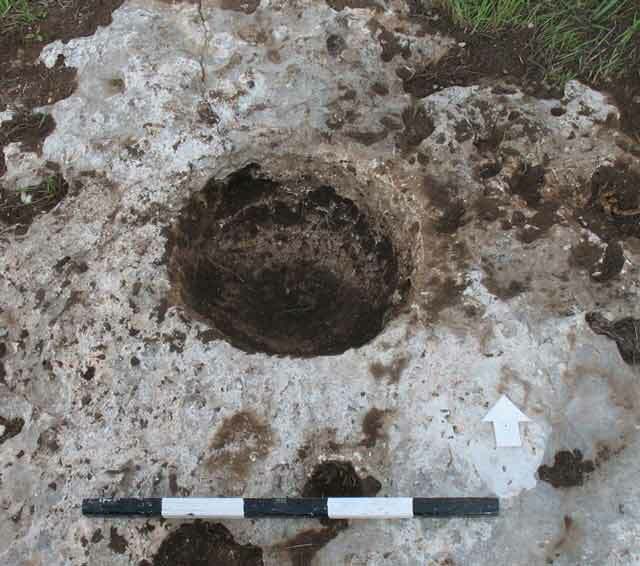 The exposed installations augment those that were uncovered in previous excavations in the vicinity, and they are indicative of the crops grown in the agricultural plots of the settlements at Horbat Haruba and Horbat Ashun. 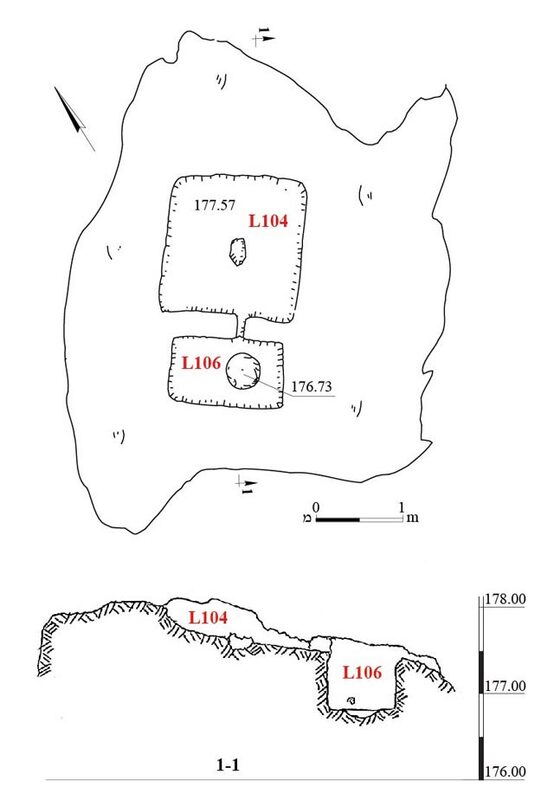 Despite the lack of datable finds, the winepresses and cupmarks should probably be attributed to the Byzantine period, based on what we know from the agricultural installations excavations nearby and in the adjacent ruins. Crispin S. 2015. Modiʽin. HA-ESI 127. Toueg R. 2015. Modiʽin. HA-ESI 127. 3. Winepress 100, plan and section. 4. Winepress 100, looking northeast. 5. 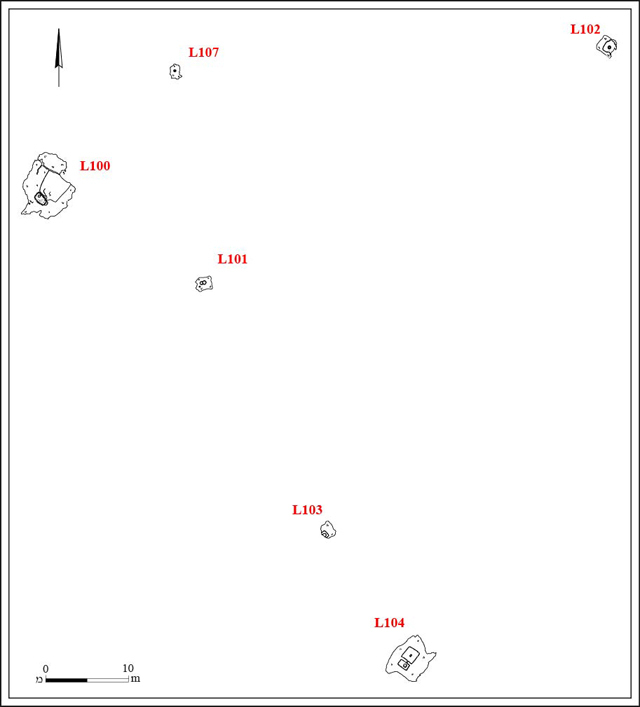 Cupmark 107, plan and section. 6. Cupmark 107, looking north. 7. Bodeda 101, plan and section. 8. Bodeda 101, looking west. 9. Cupmark 102, plan and section. 10. Cupmark 102, looking north. 11. Winepress 104, plan and section. 12. Winepress 104, looking south. 13. 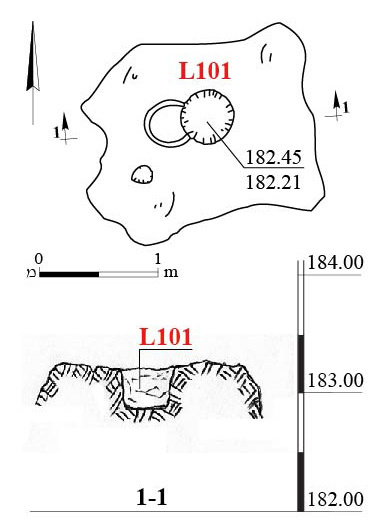 Cupmark 103, plan and section. 14. Cupmark 103, looking west.